There is a massive increase in mHealth app development costs. Today the average mHealth app costs $425,000 to develop until launch. 47% of the costs are outsourced externally on development, 11% are outsourced externally on marketing. 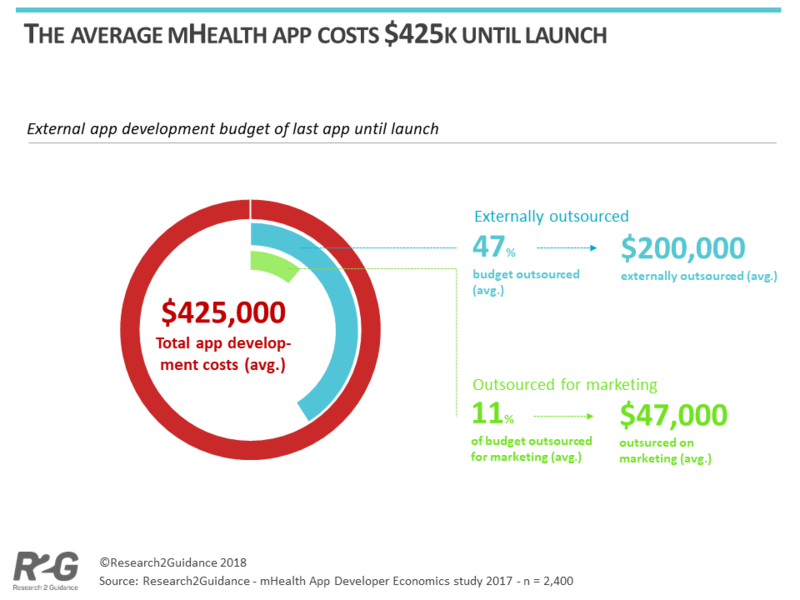 It costs $425,000 today to develop a mobile health app. $425,000 are just the average expenditures including internal and external development costs as well as marketing costs. The expenditures don’t include maintenance or follow-up development costs after launch. Companies that outsource more than average of their development budget are ‘Pharma companies’ and ‘mHealth app companies’. Those companies outsource 80% or more of their external development budget. – Companies with a higher budget are outsourcing more of their budget. The more money a company has allocated for development, the more money will be outsourced. – Big companies are outsourcing more of their budget than small companies. Corporations with more than 5,000 employees are outsourcing above average of their development budget. – Companies with the business model “transaction” (e.g. selling drugs, selling devices) are outsourcing more of their budget, which again hints to pharma companies. Nearly two thirds (62%) of those companies are not earning any money at all with their apps (average value: 40% are not earning any money with their apps). On the other hand, companies that are not outsourcing a lot of their development are “low earners”. One third (33%) are making between $10k and $100k (on average 24% are making between $10k and $100k). There are hardly any differences in regional nor in experience in app publishing (number of apps published) nor in development time. Also, there are hardly any differences between experienced (minimum 7 years industry experience) and inexperienced (maximum 2 years industry experience) market players. Companies that outsource a lot on development also outsource more of their external budget on marketing. And speaking of marketing: Their preferred marketing channels differ from the average: They are relying more on social media and influencer marketing. In this above app example by far the biggest part of the money has to be spent on the special healthcare functions – approximately two thirds of the costs. Those healthcare features are also the burdens that make healthcare cumbersome for industry newcomers. Different standards, data security, compliance and privacy are making development hard to understand and hard to execute. For industry newcomers not familiar with the according rules, regulations and best practices might take months (or years) to understand. In the future, technologies included in healthcare apps will be much more complex: Artificial Intelligence / Machine Learning are a lot more difficult to develop. The complexity of health apps – mostly the complicated healthcare environment –is what drives up development time. Most apps are developed within one year (56%), four fifths (84%) within 2 years. But also, most market players are inexperienced and need more time for their app development. As we know from our previous market analyses, the majority of market players in digital health is rather new to the industry, thus rather inexperienced. Even for experienced publishers it can take 3-4 months alone to e.g. adapt an mHealth app to US-American Medicare & Medicaid standards. For players who are not familiar with this subject and its regulations, it might take much longer. Health documents (e.g. related to Medicare & Medicaid) are often huge (with several hundred fields to be connected, which extends development time immensely. The time frame above (2 years) includes only the time until app launch. For most mobile health apps app development is not finished after the launch. For start-ups app development as well as development of the business model is an ongoing task, thus a long-term project. App with more functionalities, longer decision cycles, information seeking periods, higher marketing budgets or more complex technologies like machine learning will drive up costs. From our research some years ago, we know that the cost of app development has risen significantly over the last few years. In one of our research projects conducted in 2011 development costs of an app back then ranged from $30,000 – $40,000. (These numbers refer not to mobile health apps. So, expenditures for an app have increased tenfold since 2011). Not only development but also marketing of mobile health app has become much more expensive. Getting a health app in front of the eyeballs of potential users and being able to cut through the noise of the millions of the 325 thousand healthcare apps out there is much more expensive today. It is not without reason that mHealth app publishers consider “Partnerships with health associations” to be the number one marketing channel – whereas “Pay-per-install campaigns” and “advertising in app stores” rank last and 3rd last in terms of most effective marketing channels in healthcare. Looking forward we expect development costs of mobile health apps to keep on increasing. Consumer expectations are pushing apps’ complexity. Developers designing new apps should make sure that they are up-to-date with consumer expectations and best practices. There are a lot of healthcare apps out there that provide hardly any value to consumers. Best-in-class apps are raising the bar for all other health apps. Those apps are driving up the mentioned consumer expectations, thus development time and costs. App development in healthcare has become an investment business. Our research shows that generally, the more time and money is invested into a mobile health app, the more successful it will be. 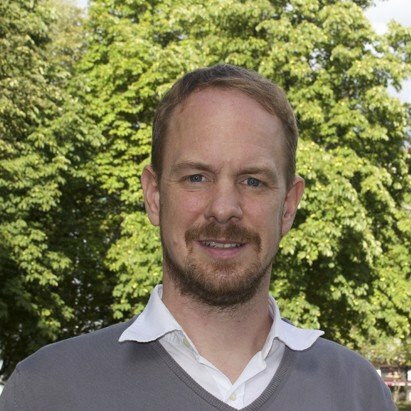 Producing a successful mHealth app as an “indie developer” is becoming more unlikely – especially when taking marketing costs into consideration. High expenses in development also means high potential for costs savings. There is a huge savings potential for service providers that are offering a shortcut, a cheaper or better solution for any of the big cost factors in mHealth app development. Opportunities for IT services providing easy integration and standardisation could be solutions for HIPPA compliance, data security and/or data protection (there will be a new law “kicking in” in Europe in May 2018). There are more and more of those solutions available, that are helping mHealth app publishers cutting through the jungle of laws, regulations and standards. Today (March 21st 2018) Apple announced the launch of their new machine learning framework for app developers called ‘Core ML’. The framework allows developers “easy integration of machine learning models enabling you to build apps with intelligent new features using just a few lines of code”. This means that mHealth app developers possibly don’t have to go through the very time-consuming process of develop and training their own machine learning algorithm for use cases like face detection, text detection, barcode detection, food recognitions or image registration. 47% of mHealth app development costs are outsourced to third parties like development agencies, marketing agencies or digital consultants. This presents a huge opportunity for agencies. As shown in our first report, in fact, 17% in the digital health community are IT companies and agencies, realizing business opportunity in the health industry. In the text above we have stated that pharma companies (12% vs. 4% on average) and the heterogenous group of mHealth app companies (25% vs. 16% on average) are outsourcing above average of their external development budget. Other potential groups for agencies are medical device manufacturers and health insurers. Also, for marketing agencies mHealth app publishers are interesting. 11% of all costs are outsourced to marketing mHealth apps. The share of 11% is only referring to the expenses until launch. Especially for marketing agencies the large portion of the money is spent after the launch in the different phases of the app’s life cycle. This article has been focussing on the costs side of mHealth app development. The earnings / revenue side is also part of our report “mHealth Economics – How mHealth App Publishers Are Monetizing Their Apps”. You can download our free whitepaper here.